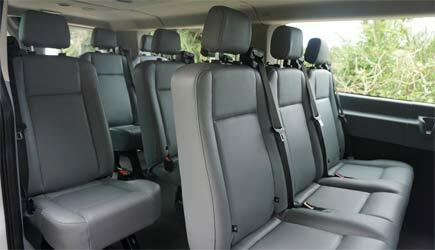 A large van for bigger families, or a small van for couples & individuals. 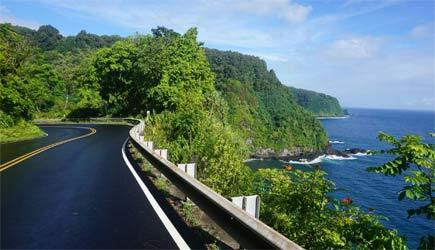 The hairpin turns and one lane bridges on the Road to Hana is a must do experience for any Maui vacation. Let the whole family enjoy the ride with a Private Tour! The beauty of nature on this tour is amazing, and there's more depth that comes from the history and stories woven throughout the journey. Holo Holo Tours provides a cooler with ice & bottled water, and there is lots of space to bring your favorite beverage along. They also provide fresh banana bread as a snack. Bring cash for lunch and roadside stands/goodies. There is a lot of good food along the way, and it's is a great way to experience the local flavor. There will be many options for lunch time - fresh fish food trucks, taco stands, thai food, Hana Ranch - Maui cattle beef burger truck, huli huli chicken, Hana Farms, etc... They ask guests to have breakfast before meeting in the morning. 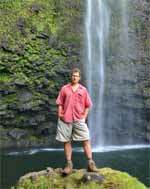 Holo Holo Tours offers 3 great private tour options to Hana. The tours depart from the Kahului Park & Ride. Hotel pick up is available upon request for an additional fee. 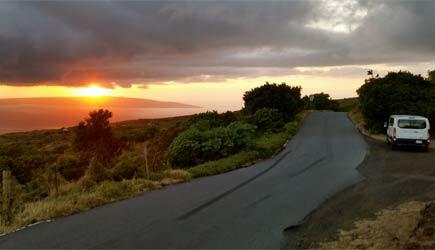 Taste of Hana is 5-6 hours, and the departure time is flexible (they recommend 8am -10am). Your journey begins through the swaying grasses of Maui's sugar cane fields, and your guide will tell the tales of the plantation era. 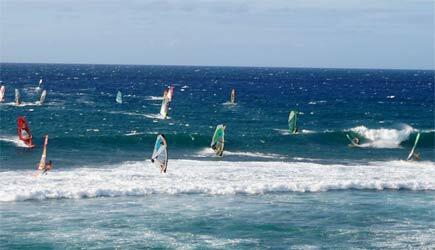 The first stop is Ho'okipa Beach Park, which is a world class surfing and wind surfing destination. You can walk down and see Hawaiian Green Sea Turtles basking along the shoreline. Then we will cruise our way through the rolling countryside of Huelo into a thick bamboo forest. Before you travel deeper into the winding twists and turns, you will stop to admire at vibrantly colored rainbow eucalyptus. Gaze upon streams and waterfalls surrounded by ferns, fruit trees, moss, bamboo, and birds. Depending on the strength of the flow, you may stop for a swim in a waterfall pool. Next, visit fruit stands for shave ice & the island's famous Banana Bread! Keanae peninsula is next of the agenda, and you will be taken to a traditional Hawaiian village known for its taro fields. Mahi'ai (cultivators) tend to the fields in the same fashion as their Hawaiian ancestors. Visit the only building to survive the devastating tsunami of 1946, an original stone missionary church built in 1856. 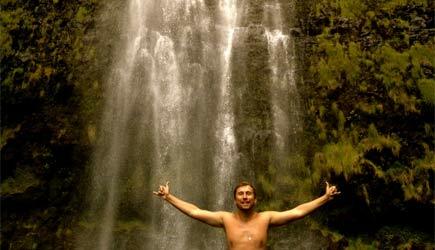 The final stop is at Wailua, the village next door, and it has the best waterfall on the road to hana. 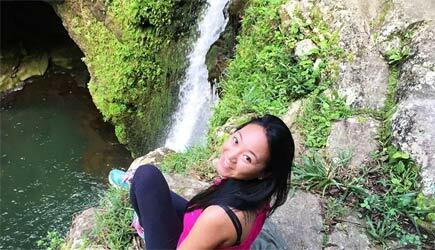 Waikani is a grand 3 tiered waterfall, and you can take a short adventurous trail to the base. Hana Bound is 8-9 hours with a morning departure between 7am – 8:30am. 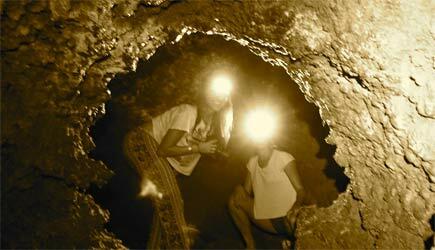 In addition to sights from Taste of Hana... your journey takes your to an underground path through an ancient lava flow, and you will use headlamps to observe the fascinating features. This is a must for those interested in Hawaiian mythology, caves, and geology. Your guide will teach you about Pele, the Goddess of Fire who created the Hawaiian Islands, and a famous deity often referred to as Ka wahine ʻai honua, "The earth-eating woman". Take a sweet treat break at Coconut Glen's, and enjoy the culinary delights of ice cream and candy made from Maui coconuts. 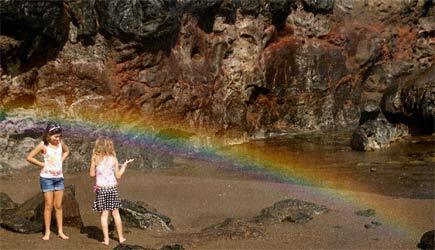 You will stop at Wai'anapanapa Beach Park, which means "glistening water" or "water flashing rainbow hues". There is a beautiful contrast between the black sand beach, and the deep blue and green ocean. 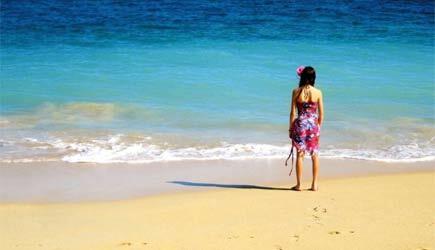 It is here you can swim through the sea caves, dip in the ocean, or just enjoy the tropical beauty that surrounds you. Nahiku Marketplace is the next stop, and it is a mini-village of tropical delights and a excellent place to indulge in local-style cuisine such as smoked fish, baked 'ulu (breadfruit), or coconut shrimp. You can also find a variety of locally made gifts. The final destination is Hana town. 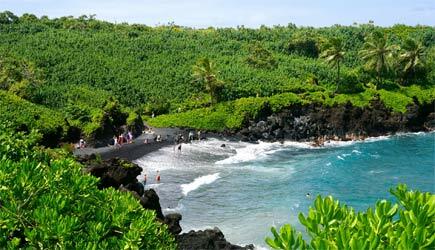 Hana was the seat of power for the entire island in the 15th Century, and it was once favored by the Ali'i (royalty). Your guide will teach you about the changes from these native times through the plantation era ending in modern day. All The Way Around is 10-12 hours with a morning departure between 7am – 8am. In addition to sights from Taste of Hana and Hana Bound...your adventure takes you past Hana on a narrow and rugged road. 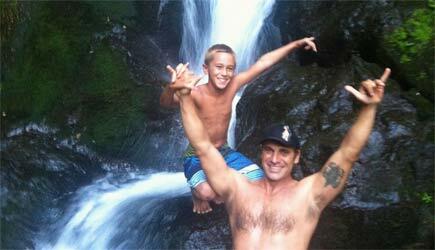 The lush jungle of Kipahulu gives way to Maui's hidden side of barren lava fields. The leeward part of Haleakala is exposed and grass and shrubs scatter over the jagged lava rocks. You can see the stark contrast between the wet and dry sides of the volcano. 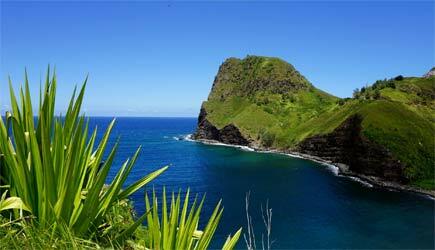 Next, climb up to get a birds eye view of Maui's coastline and outer lying islands. 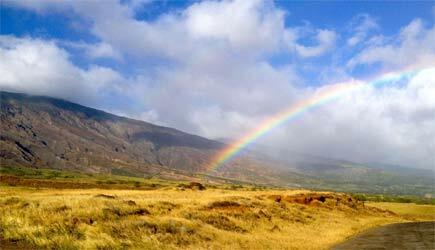 And then you will round the corner, and you will refresh with wine tasting at Maui Wine. This vineyard is located on a historic royal estate, and is a perfect setting to take in the days adventure. The sun sets as you are driven back to the original starting point. Feel free to relax, reflect or take a nap! 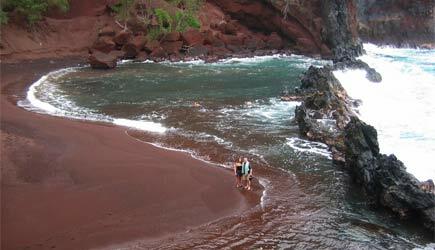 The West Maui Adventure is a 5-6 hour excusrions. The Morning Tour departs between 8am-9am and the Sunset Excursion departs at 1pm. 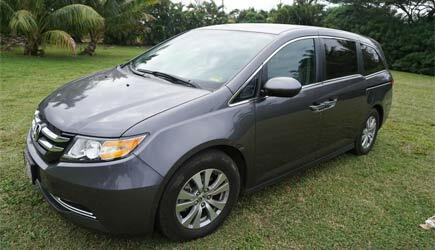 Pick up is available at most West Maui resorts. 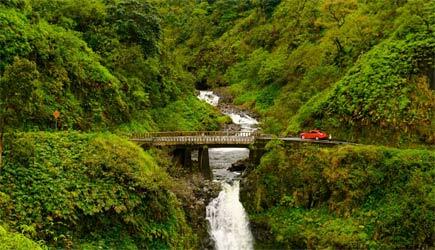 Begin your journey by traveling on a road tourists rarely visit, and stop at a stream with waterfalls and pools. Next you will continue up a narrow road cut into the mountainside. 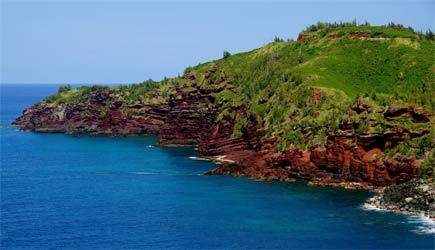 There will be several lookouts with breathtaking views of rugged, steep, and exposed coastline. You will also visit a cliff top gallery that features more than 100 local artisans. Here you can fine art, jewelry, and home decor. Next, drive into the isolate and native Hawaiian village of Kahakuloa where you can taste their famous Banana Bread and and Lilikoi (passion fruit) butter. After departing the village, you will wind around to the remote bell stone fields. Massive lava bombs were spit out during Halemahina's last eruption, and they landed near the coast. Bell stones are hollow inside, and you can ring them by tapping them with a rock or stick. 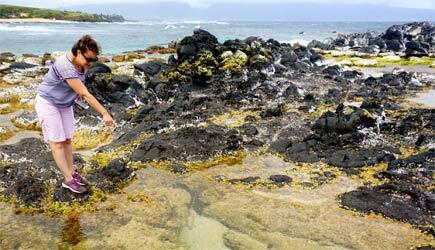 If you are up for an adventure, there is a crumbly trail down to the Olivine Tide Pools where you can observe marine life and dip into the salty heart-shaped basin. Next on your journey is Nakalele Point. A lava shelf extends into the sea, and waves follow a pathway underneath forcing water through a small hole. 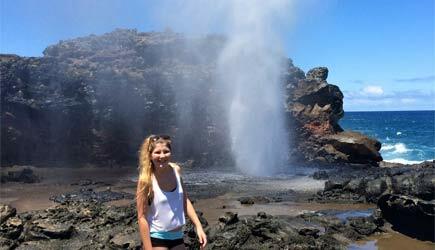 This creates an "eruption" of water similar to a geyser or a whale's blow hole. Sprays can reach over 100 feet into the air, and it goes off 90% of the time. If the surf is high, you must keep your distance. 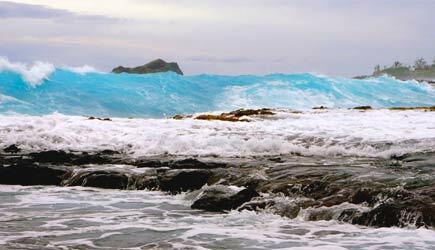 If the waters are calm, you can take a trail to stand nearby and feel the natural ocean shower! 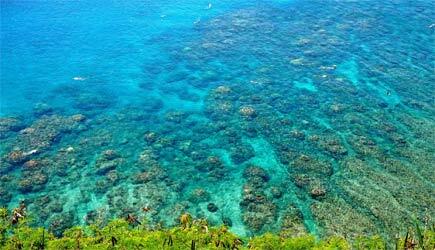 Then you will stop at Honolua Bay to see Maui's healthiest reef from above. You may catch a glimpse of swimming turtles or frolicking dolphins! 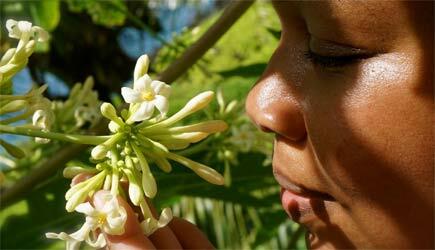 Take a flat jungle walk to the mouth of the bay, and taste honeysuckle and passion fruit along the way. After leaving Honloua, you will enter the land of resorts. 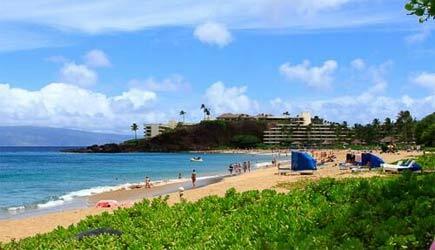 Pass by Kapalua where golf championships are held every year, and Ka'anapali Beach resorts which was once an area reserved for royalty. You will have time to stroll through the old whaling port of Lahaina, which was once the capitol of the Kingdom of Hawaii. The old buildings that house shops, restaurants, and galleries were originally built to support whaling and trade. 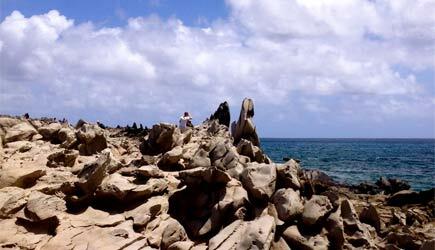 Your adventure ends with Hawaii's largest collection of ancient petroglyphs, which depict native way of life. If you are traveling to Maui any time between December through May, whale watching is a must, and you will stop at several spots along the way to look out for humpbacks playing and jumping. If you are staying at a West side hotel, then you can "exchange" your leisure time in Lahaina for exploration of ʻĪao Valley. 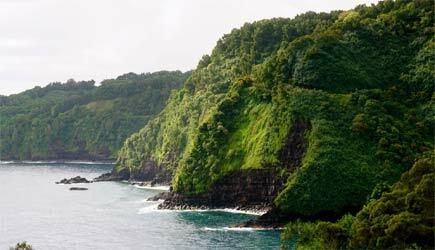 You will visit the sunken caldera of Maui's western volcano and the ʻĪao needle (a natural basalt tower, gaze upon steep valley walls with waterfalls cascading down. ʻĪao valley has the largest streams on the island, which makes it the main source of fresh drinking water. Locals and visitors are often seen in the rivers and swimming holes, and the waters are known for its healing powers. 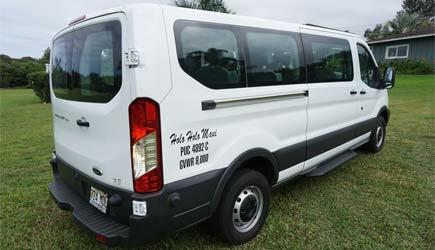 Holo Holo Tours has a flexible departure and reture times and can work with the schedule of cruise ship passengers. For those who want truly personal service, private island tours are a great way to go. Your itinerary can be customized to your interests, and your guide will feel more like a "friend for the day" than a tour guide. No crowded tour vehicles, and no waiting for slow members of another party at each of the stops! You move at your own pace and see the things you want to see. Your private guide will be happy to take as many picture of you as you like too ... that just isn't realistic in a larger group tour. any allergies, medical conditions, etc.